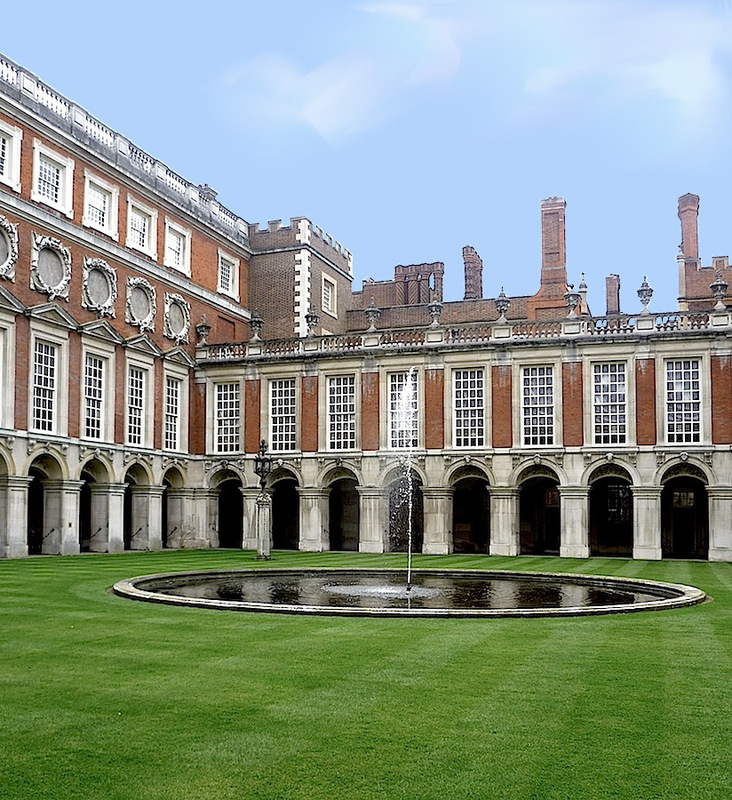 The main (west) front of Hampton Court Palace, on the north bank of the Thames about fifteen miles to the south-west of London. The route by road was an attractive one: "Our line is from Apsley House at Hyde Park Corner, through Kensington to Kew, Richmond, Twickenham, and Hampton Court; — a very peasant way, we think, and one of the nearest" (Jerrold 1). 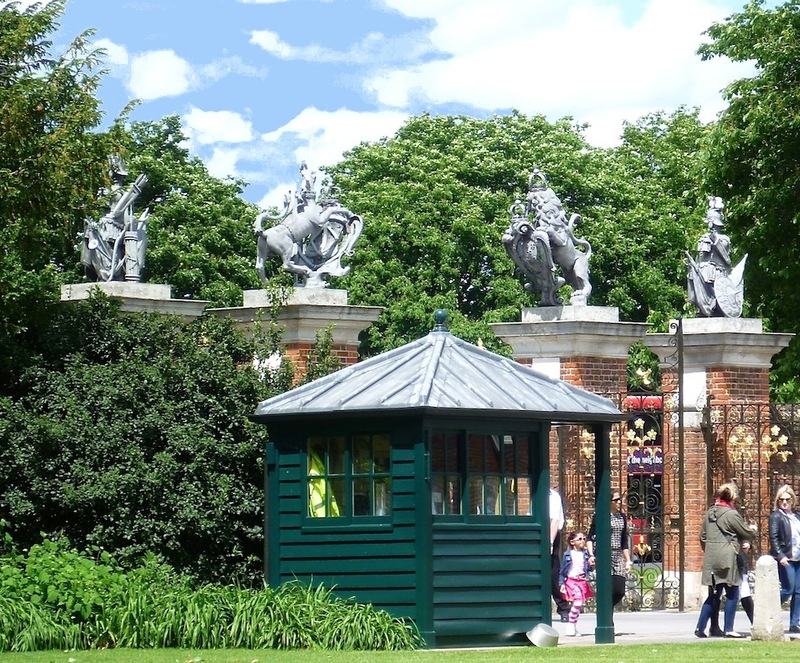 The Trophy Gates at the west (main) entrance, on Hampton Court Road. These were renewed in 1780. 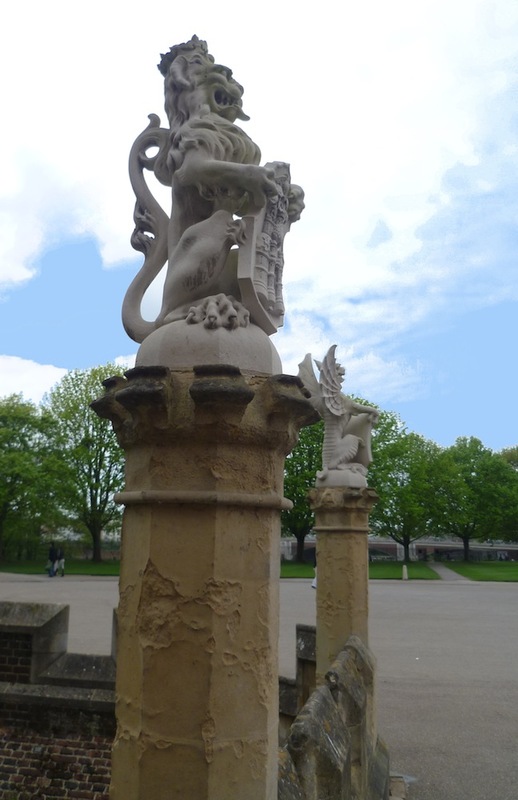 The inner stone piers are crowned with lead heraldic figures of the lion and the unicorn, and the outer ones are crowned with trophies of arms. Left: Seen from outside the grounds. Right: Seen from just inside the grounds. The pre-Victorian architectural history of this splendid Grade I listed Tudor palace goes back to 1514, when Cardinal Wolsey bought the site from the Knights Hospitallers. It is studded with great names. Some architects did much more than others, but the roll-call includes, most notably, Inigo Jones, who was appointed Surveyor of the King's Works by Henry VIII when it came into his possession in 1615; Sir Christopher Wren, Surveyor from 1669 (see Thurley 109, 139); Thomas Hardwick Junior, who was Clerk of Works for George III from 1810 (see Port); and Sir John Soane, who was one of the three architects attached to the Board of Works, and oversaw restoration and repairs on the main buildings from 1814 (see Watkin). Of these, by far the most important was Wren. He pulled down Henry VIII's old state apartments, and created a new "Fountain Court" to the east, surrounding it with ranges in a fashionable French Renaissance classical style. This gave the palace its impressive east front. The palace had been a grand royal residence from 1529, when Henry VIII moved in, right up until Charles II, who restored and redecorated it. Although James II never lived there, Wren embarked on his major rebuilding programme under William and Mary, and, after Mary's death, William moved in alone in 1699, supervising the arrangement of his artworks there and developing the gardens. Work continued during the reigns of Queen Anne and George I, but George II was the last monarch to live here, and then only during the summers of 1728-38, for hunting. As a royal residence, therefore, the glory days of Hampton Court were long over when William IV came to the throne in 1830. From left to right: (a) The Great Gatehouse. The archway in its three-storey structure is entered after crossing a stone bridge across the moat. 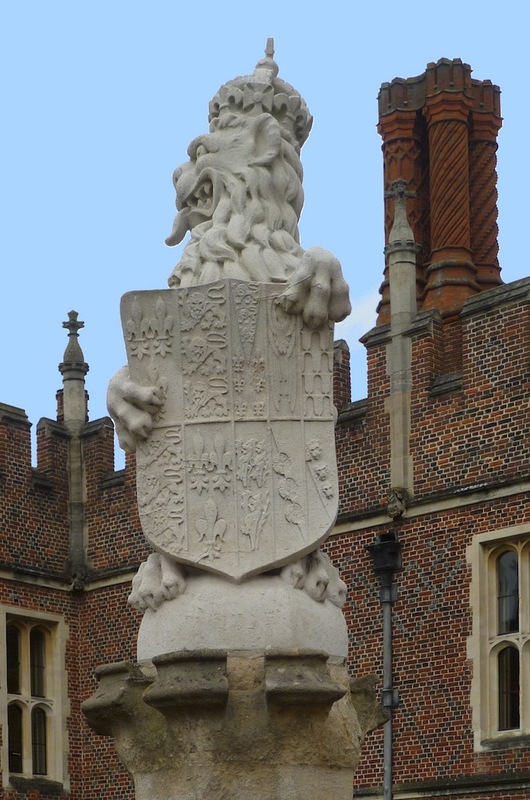 (b) and (c} Two views of the heraldic Lion of England, the first of the "great beasts" adorning the bridge, a twentieth-century copy of the Tudor original. By now (in fact, since George III started the practice in the 1760s), much of the great Tudor palace was split into "grace and favour" apartments for people who had given good service to the royal family, and already parties of guests were being conducted round by the deputy-housekeeper, for a fee (see Law 285). However, it was William IV who saw its potential for both housing and displaying artworks. Queen Victoria went a step further, on 15 August 1838 issuing an order for the rooms to be closed and reappointed: "they were re-opened, in November, 1838; since which date they have never been closed to the public, — except, of course, in times of national mourning, — and every facility has been afforded, ever since, for seeing and enjoying Hampton Court, and its treasures" (Law 351). 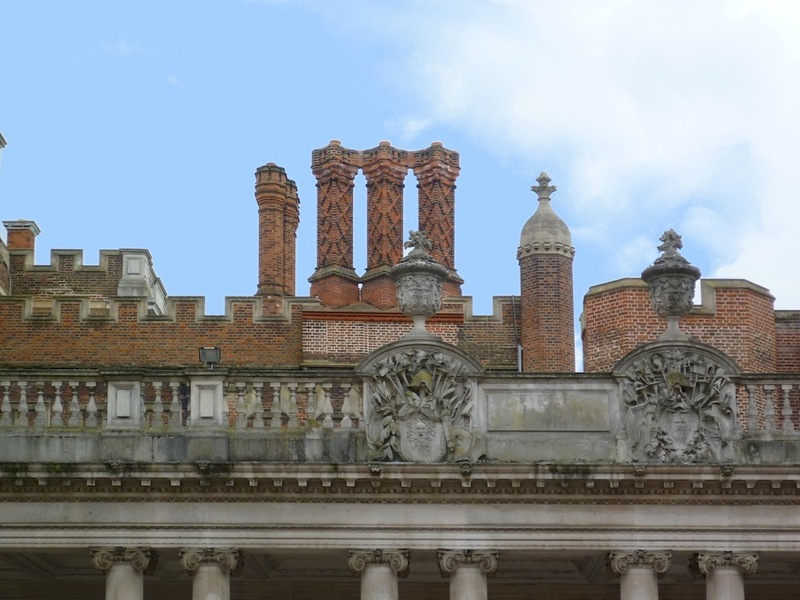 Two of the main courts: (a) Wren's Portland Stone colonnade in the Clock Court sports two trophy reliefs and balustrade vases, with Tudor-style chimney-pots in the background. (b) The Clock Tower of the great 1540 astronomical clock in Clock Court, above Anne Boleyn's Gate. (c) A corner of Fountain Court, designed by Wren. Free public access made the palace terrifically popular: "visitors, who hitherto had been numbered by scores or hundreds, rose immediately to tens, nay to hundreds, of thousands; and they continued to increase, during the first four years after the free opening of the Palace, from 115,971 in 1839 to 122,339 in 1840; and from 147,740 in 1841 to 179,743 in 1842" (Law 362). One very special visitor was the Queen herself: "At about 3 we went in pony phaeton (Albert driving me) to Hampton Court," she wrote in her journal on 3 August 1840. There are over eighty mentions of the palace in her journals: Albert liked to play tennis there, and she particularly enjoyed visiting the ponies and horses, some of which she had ridden in the past, in the "reconstituted stud" (Vol. 33: 300). Others who visited included the sculptor Sir Francis Chantrey and the prominent Tory politician and journalist John William Croker (see Law 373). In his retirement, the scientist Michael Faraday was granted a house nearby, next-door-but-one to where Wren had once lived, and liked to enjoy "the beauty of the sunsets from the palace gardens" (Jones 336). 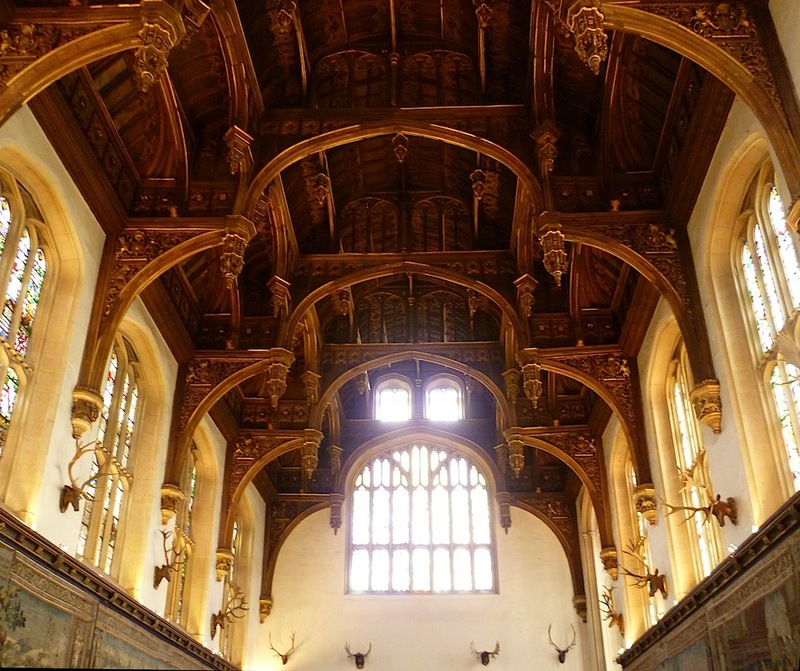 Left to right: (a) The magnificent ceiling of the Great Hall, built during the reign of Henry VIII and restored under Edward Blore in 1847 (Law 369). (b) Stained glass window in the Great Watching Chamber, the richly decorated ceiling of which was restored by Lessels in about 1884 ("John Lessels"). 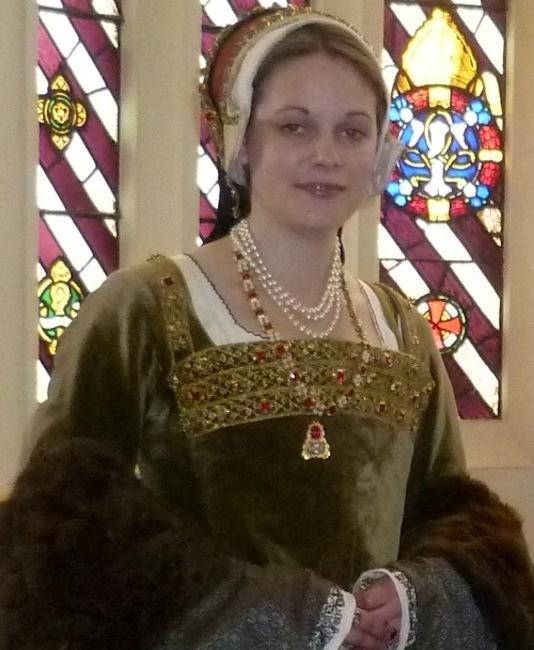 (c) A re-enactor playing Henry VIII's fifth wife Catherine Howard, entertaining present-day visitors in front of this window. Examining the interior, later commentators like Walter Jerrold found that the "tapestried walls, the high windows, and the fine Perpendicular hammer-beam roof" of the Great Hall had retained their character after the early Victorian work on the hall, leaving it once again "a magnificent and pleasing whole" (39). Jerrold also praised most, though not all, of the new stained glass in here, which was put in by Thomas Willement (1786-1871; see Jesse 23). 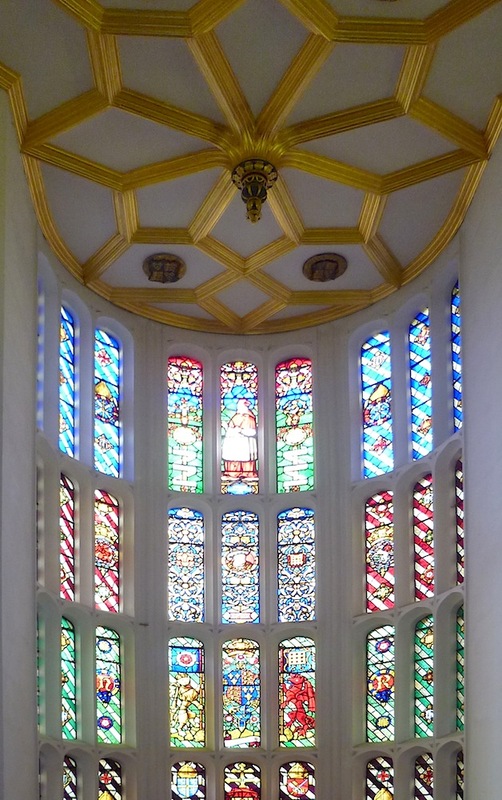 The next phase of Victorian restoration, under Lessels, was even more scrupulously faithful to the original Tudor work: "Before long, Anne Boleyn's Gateway, the Great Gatehouse, several of the kitchen courtyards, Wolsey's Closet, the West Front moat and the Chapel windows had been restored" ("Up to the Present"). Lessel's drawings for the Gatehouse date from 1881, and the new tracery windows in the Chapel were completed in 1890, after Lessel's retirement ("John Lessels"). In our own times, Hampton Court is recognised as a national treasure to be preserved at all costs, a recognition put to the test when six years of restoration were needed after a devastating fire in 1986. Three-quarter view of the late seventeenth-century east front by Wren, and part of the formal Fountain Garden. The Palace stands in beautiful, varied and extensive grounds, which are themselves Grade I listed, and have as long and complex a history as the Palace itself. They are most famous for their maze, and for the Great Vine planted by Capability Brown when he was master gardener there in the eighteenth century — also for the fact that the Home Park area is the venue for the Royal Horticultural Society's Flower Show every summer. Much of the credit for developing the gardens in the nineteenth century goes to Edward Jesse (1780-1868), Surveyor of the Royal Parks and Palaces, who managed to combine "freedom from vexatious restraint ... with the respect and dignity, which should invest a Royal Palace, and the reverence, with which a great historic building should be treated" (Law 371). The listing text tells us that Hampton Court Park, which lies to the east of the Fountain Garden, was opened to the public in 1893, extending their access considerably, so here again the Victorian contribution was highly significant. 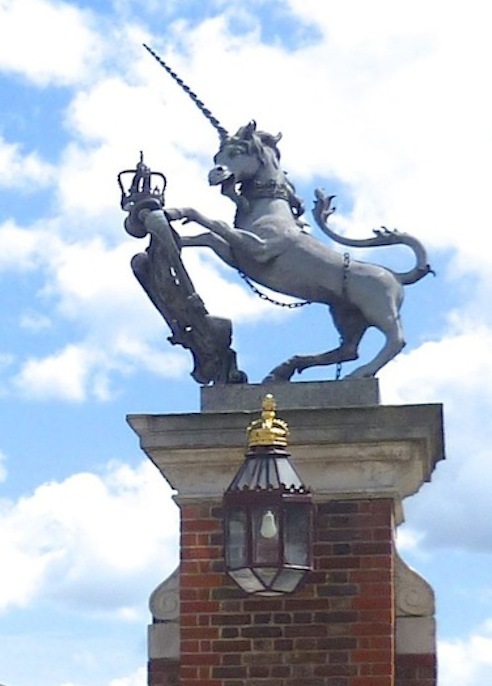 Close-up of the unicorn at the Trophy Gate. One of the reasons for Hampton Court's popularity throughout the period was that it was open on Sundays — much to the disapproval of Sabbatarians (see Law 362-367). But one can imagine that the Victorians, whose interest in the Tudor past is reflected in the architectural styles of the Domestic Revival, would have been fascinated by the place — and that the palace, in its turn, would have given fresh impetus to their interest. "Decorative Chimneys." 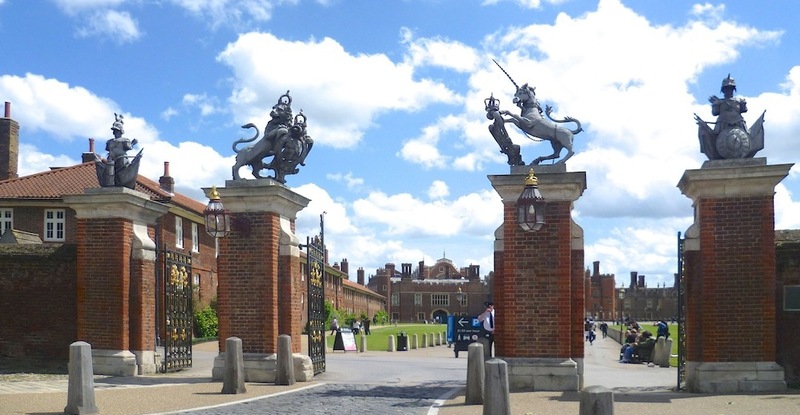 Historic Royal Palaces: Hampton Court Palace. Web. 3 January 2017. "Hampton Court" (listing text for the gardens). Historic England. Web. 3 January 2017. "Hampton Court Palace." Historic England. Web. 3 January 2017. Jerrold, Walter. Hampton Court Palace. London: Blackie and Son, 1912. Internet Archive. Contributed by the University of California Libraries. Web. 3 January 2017. Jesse, Edward. A Summer's Day at Hampton Court: A Guide to the Palace and Gardens 5th ed. London: John Murray, 1842. Google Books (free ebook). Web. 3 January 2017. "John Lessels: Basic Biographical Details." Dictionary of Scottish Architects. Web. 3 January 2017. Jones, Henry Bence. The Life and Letters of Michael Faraday Vol. 2. 2nd rev. ed. London: Longmans, Green, 1870. Internet Archive. Contributed by Robarts Library, University of Toronto. Web. 3 January 2017. Law, Ernest. 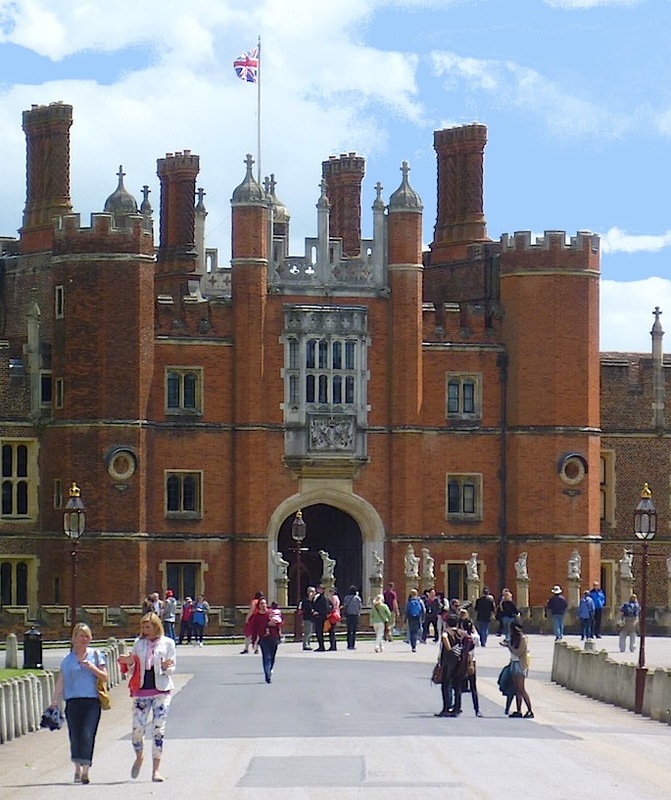 The History of Hampton Court Place. 3 vols. Vol. III: Orange and Guelph Times. London: George Bell and Sons, 1890. Internet Archive. Contributed by the University of California Libraries. Web. 3 January 2017. Page, William, ed. 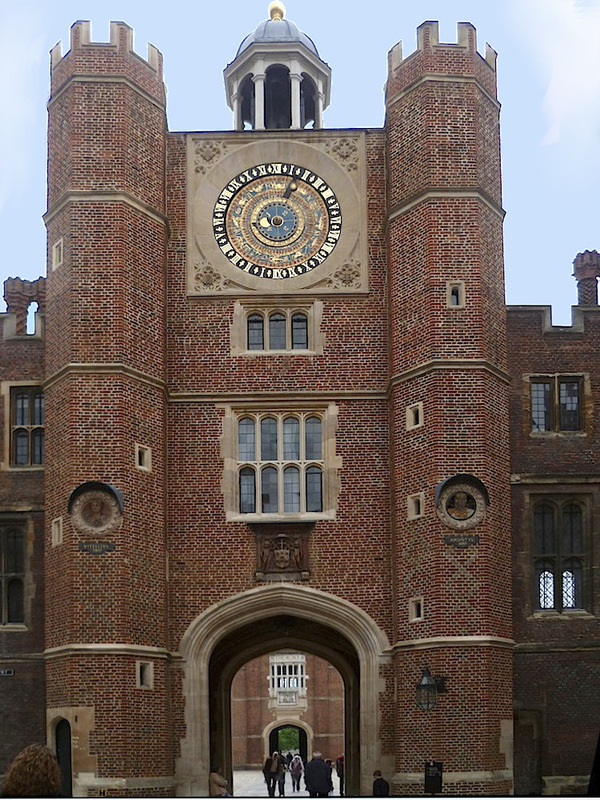 "Spelthorne Hundred: Hampton Court Palace, architectural description." A History of the County of Middlesex: Volume 2, General; Ashford, East Bedfont With Hatton, Feltham, Hampton With Hampton Wick, Hanworth, Laleham, Littleton. London, 1911: 371-379. British History Online. Web. 3 January 2017. Port, M. H. "Hardwick, Thomas (1752–1829), architect." Oxford Dictionary of National Biography. Online ed. Web. 13 January 2017. Queen Victoria's Journals. Web. 3 January 2017. "Up to the Present"." 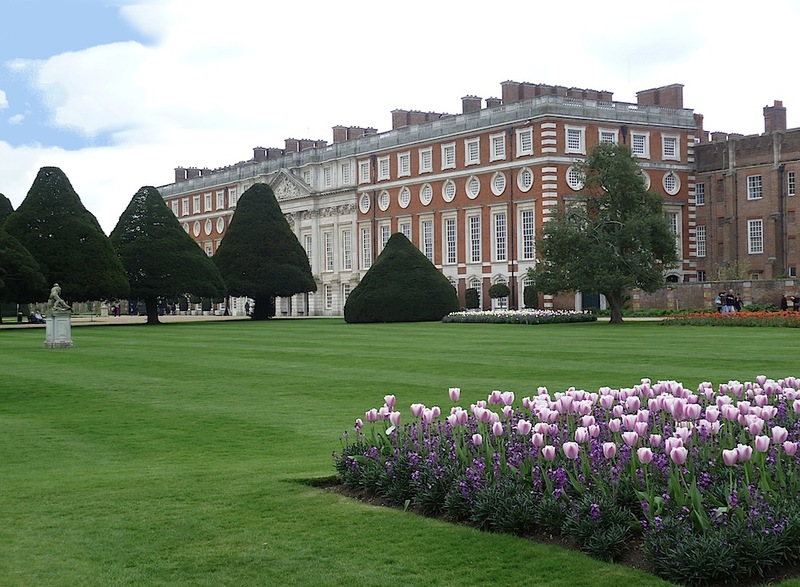 Historic Royal Palaces: Hampton Court Palace. Web. 3 January 2017. Watkin, David. "Soane, Sir John (1753–1837), architect." Oxford Dictionary of National Biography. Online ed. Web. 13 January 2017.